Despite the creepy-crawly name, the spider plant is among the most popular (and easiest to grow) of all hanging or trailing houseplants. While these exceptionally hardy plants will survive in less than perfect conditions, in perfect conditions they are stunning. A mature plant will form tight rosettes of arching leaves with a profusion of hanging plantlets on long stems, up to three feet, somewhat like a bushy green mane. Although there is a pure green variety, the most common variety seen in garden centers in the green-and-white striped 'Variegatum.' Mature plants have small white flowers. While spider plants will grow under most conditions, there are some things to consider if you want your plant to thrive. In terms of light, they are undemanding. Spider plants prefer bright light and tend toward scorching in direct sunlight. However, they will grow in conditions ranging from semi-shady to partial direct sun. You should water them liberally through the summer and mist them occasionally. During winter, cut watering back. When it comes to temperature, do not let them fall below 50 F or expose them to cold drafts. 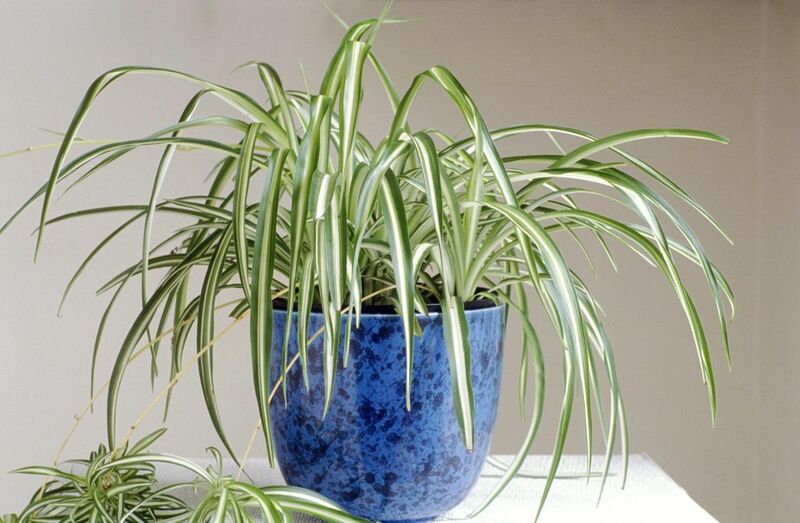 Spider plants like fast-draining, well-aerated potting mix. Feed them weekly during the summer with liquid fertilizer or use pellets at the beginning of the growing season. Spider plants are one of the easiest houseplants to propagate: simply pot up the small plantlets. Make sure the young plantlets have developed roots. Alternatively, mature plants can be divided during repotting. In a pinch, you can turn one of the plantlets into a great housewarming gift. Native to South Africa, spider plants are an essential part of any hanging plant collection. Pot them into simple baskets, provide them with ample water and food, and within two years, you should be rewarded with a full display. Alternatively, they can be positioned atop columns for a beautiful display. Note that plantlets will not form on immature plants. The most common problem is under watering and feeding during the growing season. These are robust plants. Spider plants are pretty hardy, but there are a few insects that love to turn them into dinner. Aphids, mealybugs, whiteflies, and of course, spider mites can all pose problems for your houseplants. Rinsing the plants with water is an effective way to combat pests like aphids and spider mites. However, when it comes to spider mites rubbing your plant down with a miticide is a good idea as well. Other pests respond well to the use of insecticides. If you're worried about using harsh chemicals around your yard, especially if you have pets or young children, you may want to try an all natural insecticide first. A few all-natural insecticides can be made with ingredients you probably already have in your pantry, like vinegar.